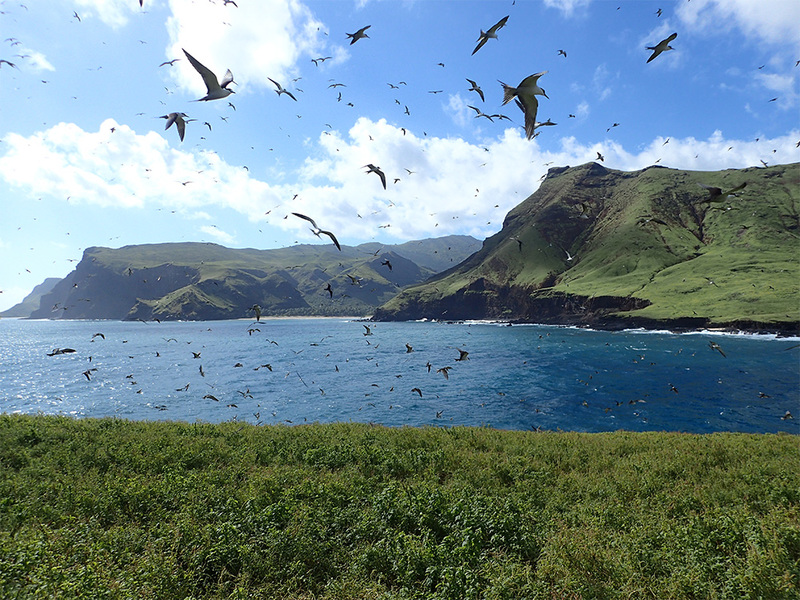 Marquesan Island Teuaua cleared of invasive rats to protect native seabirds. This action will protect nationally significant populations of Sooty Terns, Bulwers Petrels, and other seabirds. 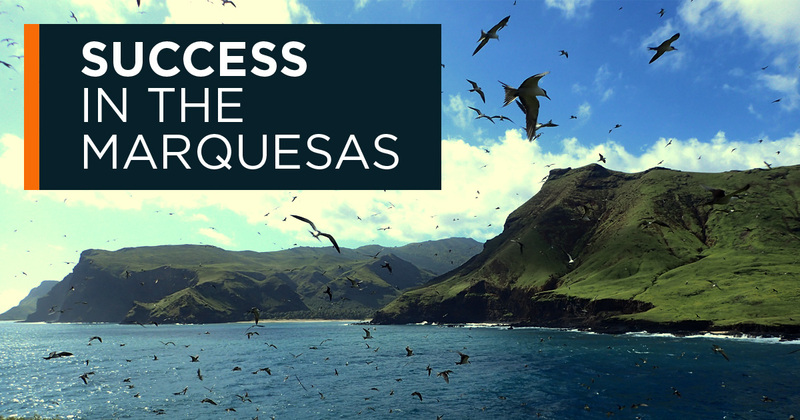 Teuaua is a stepping stone to the restoration of larger, more complex islands within the Marquesas Archipelago. The Teuaua project was logistically complex, requiring skill, tenacity, and the resolve to withstand being dive-bombed by 1000’s of birds. 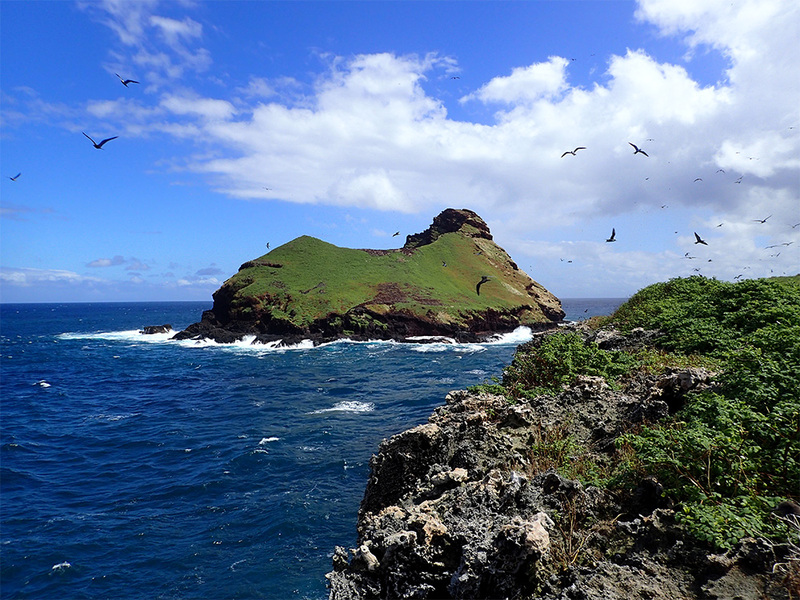 The future is looking a little brighter for seabirds in French Polynesia following the first successful removal of invasive rats and island in the Marquesas Archipelago. The project, implemented by the Societe d’Ornithologie de Polynesie (Manu), Island Conservation, BirdLife International and Association Vaiku’a i te manu o Ua, will protect a nationally significant population of 90,000 Sooty Terns. 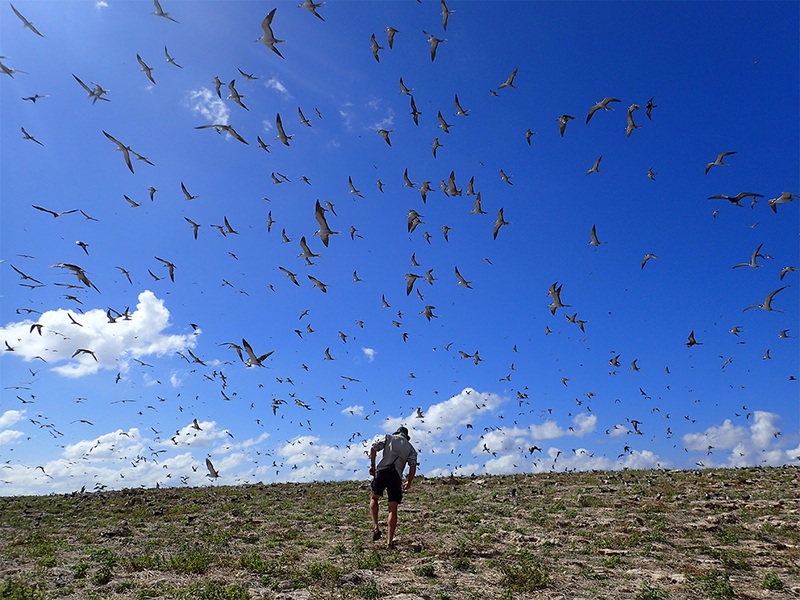 Island Conservation Project Director Richard Griffiths walks through a colony of seabirds soaring overhead. Seabirds, often referred to as ‘ecosystem engineers’, are critical to a healthy functioning ecosystem. They boost the fertility of island soils by relocating marine nutrients to terrestrial environments. These nutrients run-off into the marine ecosystem via natural weathering processes, enriching the surrounding waters, increasing coral productivity and the growth and abundance of local fish populations. Teuaua is important culturally to the people of Ua Huka. Sooty Tern (Kaveka in Marquesan language) eggs from the island are harvested once or twice a year when the Uru (breadfruit tree) are fruiting. This practice is losing popularity as younger generations become more dependent on imported food. However, knowing that they have this resource in case of supply shortages is important to the local population and Sooty Tern egg harvesting is part of their cultural heritage. The goal of the project was to restore habitat for native seabirds and plants by removing invasive rats from the island, build confidence and capacity within the local community in the field of invasive species management, and provide greater protection for the nearby island of Hemeni, an important refuge for seabird populations. 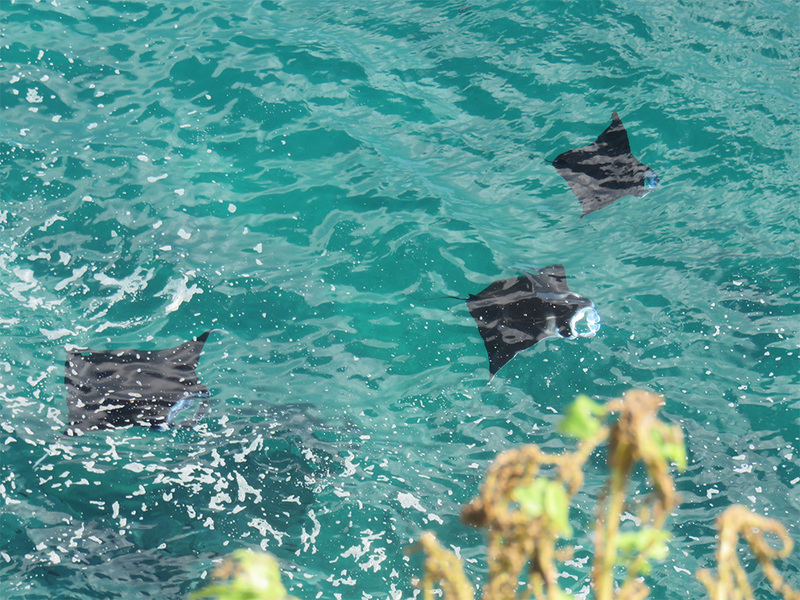 With Teuaua now free of rats, the project partnership can now focus on planning the restoration of the six other uninhabited islands within the Marquesan Archipelago. To do this they first need to find the estimated $3M USD required to implement the project that will require a support ship and helicopter. Societe d’Ornithologie de Polynesie (Manu) The Polynesian Ornithological Society, a.k.a. « Manu » (meaning “bird” in Tahitian language), is working for the protection of wild birds of Tahiti and her Islands as well as for the preservation of their habitats. A group of enthusiastic amateurs of French Polynesian birds founded this non-governmental and non-profit association in July 1990. BirdLife International is a global partnership of conservation organisations (NGOs) that strives to conserve birds, their habitats and global biodiversity, working with people towards sustainability in the use of natural resources. Together we are 121 BirdLife Partners worldwide – one per country or territory – and growing. We are driven by our belief that local people, working for nature in their own places but connected nationally and internationally through our global Partnership, are the key to sustaining all life on this planet. This unique local-to-global approach delivers high impact and long-term conservation for the benefit of nature and people. BirdLife is widely recognised as the world leader in bird conservation. Rigorous science informed by practical feedback from projects on the ground in important sites and habitats enables us to implement successful conservation programmes for birds and all nature. Our actions are providing both practical and sustainable solutions significantly benefiting nature and people. Island Conservation is the only global, not-for-profit conservation organization whose mission is to prevent extinctions by removing invasive species from islands. We work where the concentration of both biodiversity and species extinction is greatest – islands. Removing a primary threat – introduced invasive vertebrates – is one of the most critical interventions for saving threatened plants and animals and restoring island ecosystems. Once invasive species are removed, native island species and ecosystems can recover, often with little additional intervention. Since 1994, IC and partners have successfully restored 63 islands worldwide, benefiting 1173 populations of 468 species and subspecies. IC is headquartered in Santa Cruz, CA with field offices in Australia, the Bahamas, British Columbia, Chile, Ecuador, Hawai’i, New Zealand, Palau, and Puerto Rico. Projet d’éradication des rats envahissants pour la protection des oiseaux marins aux Marquises : les premières réussites !